Kazakhstanis took to social media on Friday to mock and grumble as vendors hiked their prices after veteran leader Nursultan Nazarbayev let the tenge currency join a global wave of devaluations. The tenge rate tumbled by 26.2 percent on Thursday to 255.26 per dollar as the central bank and government decided to let it float freely, seeking to support an economy hit by low world prices for its oil and metals exports. There were no reports of of street protest after Nazarbayev, who has ruled the former Soviet state virtually unopposed since 1989, said police would crack down on any "provocateurs" who protested against the new policy. 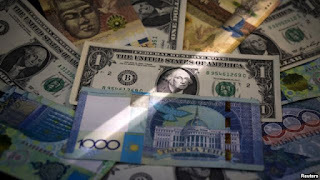 In Almaty, Kazakhstan's financial center and largest city, exchange offices offered the dollar at 253 tenge, while some shops selling pricey smartphones and household electronic goods were closed, to change price tags. A leading car dealer said it had closed for the day on Thursday but reopened on Friday after adjusting its prices. The devaluation, emulating a similar move late last year in close ally and major trade partner Russia, hit primarily ordinary Kazakhstanis, earning an average of 127,000 tenge ($500) a month, who lamented the soaring cost of food. "What am I doing? Drawing new price tags," said retired farmer Daulet Ishimbayev who supplements his pension by selling fruit and vegetables in a makeshift kiosk in an Almaty suburb. Heaps of melons from Uzbekistan and crates with Kyrgyz grapes contrasted with modest-looking tomatoes and cucumbers from southern Kazakhstan, the only local produce on sale. Asked what he expected after the tenge's sharp depreciation, Ishimbayev said: "Fewer buyers and more headaches." Kazakhstan, five times the size of France but with just 17.5 million people, depends heavily on food imports. Official statistics show meat imports increased by 41.8 percent year-on-year in the first half of this year, while imports of butter and vegetable oil jumped by 68 percent - helped by an artifically overvalued tenge. There were no signs of panic or bulk buying at local shops, most of which continued to sell staple foodstuffs at old prices. But in one grocery in central Almaty, a 43-year-old shop assistant who only gave her first name, Alma, said several female pensioners had stocked up heavily on salt, sugar and matches. "Unbelievable - just like in Soviet days," she added. Kazakhstan weathered a 19-percent devaluation of the tenge in February last year, and many citizens had been sceptical about repeated official assurances that this would not happen again. Nazarbayev, a 75-year-old former steelworker nicknamed "Papa" who holds sweeping powers, said on Thursday that he had ordered law enforcers to "suppress toughly" any protests by "provocateurs" against what he called the currency reform. Police acted promptly. As he was making his warnings in the capital Astana, police in Almaty detained two civic society activists planning a protest in a central square. Yermek Narymbayev and Rinat Kibrayev had intended to come to the Independence Monument to demand the resignation of Nazarbayev, his prime minister and the head of the central bank. The would-be protesters were to stand trial on Friday, facing up to 15 days in jail, local media reported. Social media users across Kazakhstan directed their criticism mainly at National Bank Governor Kairat Kelimbetov. "Sweet lies, but what bitter fruit they have borne!" read one of many mocking thought bubbles attached to online photos of Kelimbetov, alluding to his pledges the tenge would stay firm.